It’s not The Upside Down and there’s no Demogorgon to run away from, but Edwards Island soon becomes just as chilling a place to be. Oxenfree is a game that has been enthusiastically muttered about to me on repeat occasion, but, up until now, I hadn’t had the chance to check it out for myself. For those that may not have heard of it before, Oxenfree is a supernatural thriller. Now on Nintendo Switch, it’s a game that, coupled with its relatively short length, is best experienced in one sitting and with headphones on, if you can. You play as Alex, a smart but rebellious teenager who is still struggling to come to terms with the loss of her brother. Now, some years later, she is travelling to an old military island for an overnight beach party with her group of dysfunctional friends. And, it’s also the chance for her to get to know Jonas, her new step-brother, for the first time. What starts out with an alcohol-fueled game of Truth or Dare, soon sees Alex and Jonas explore a darkened cave nearby where their unending curiosity sees them open a triangular, ghostly rift a pocket radio. It doesn’t take long before everything goes horribly wrong, the malevolent spirits that you have stirred seeking their revenge – the group soon racing around the island to avert disaster. Oxenfree excels in its storytelling, even if the pacing can sometimes feel off and the characters never reacting to the otherworldly events that they have caused with enough horrified alarm. But, as you explore Edwards Island, it is the branching conversations that you talk through that help to make their relationships feel more believable. It was a clever decision for these interactions to happen as you clamber around the island, helping to distract you from wandering back and forth between locations. It’s the strong voice cast, too, that will undoubtedly help captivate your attention for the entirety of game’s four hour duration, whether that be Alex (Erin Yvette), troubled step-brother Jonas (Gavin Hammon), the intensely cold Clarissa (Avital Ash), the quirky Nona (Britanni Johnson), or drugged up best friend Ren (Aaron Kuban). We’re warned that every dialogue choice that is made will change the story and impact the relationships between each character, but the three responses that you are presented with to keep the conversation flowing are never black and white. 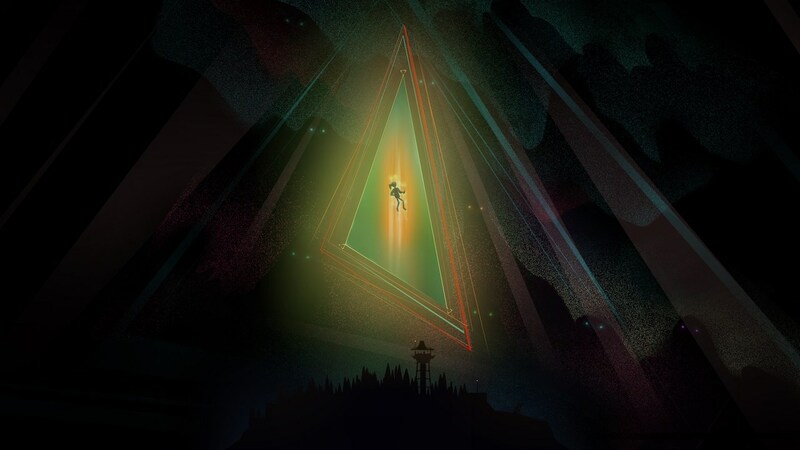 The consequences always unclear, it certainly makes the meandering chatter in Oxenfree feel more natural and lends the chance to focus on learning more about the characters themselves rather than the player fretting about which is the ‘best’ choice to make. It is the radio that becomes a clever tool, in not only letting you tune in to the Edwards Island Walking Tour to learn more about historical landmarks dotted around the island but being necessary to interact with the game’s many supernatural moments. That paranormal activity can see characters become momentarily possessed or trapped in time loops, where time is rewound but objects that weren’t there before now appear. It’s unsettling, with Oxenfree having a great sense of unease without ever having to rely on terrifying the player with jump scares. It is in these moments that the characters actually become frightened, letting a sudden urgency creep in, and a need to escape the situation before the ethereal spirits take hold. Even cycling through radio frequencies feels incredible and, in many ways more real, thanks to how well the developer has implemented HD Rumble – whether that be when playing with the Joy-Con or the Nintendo Switch Pro Controller. The audiovisual design, too, is astounding, creating an unnervingly creepy atmosphere, with characters often smaller than their surrounding environments – which can be interpreted as playing a small part in rectifying what has long been a more far-reaching problem on the island. Peel back the layers of mystery and intrigue, and what underpins Oxenfree is remarkably simple in approach. With nuanced storytelling at its ghostly heart, the pacing to this coming-of-age tale suffers in places but it will still enthral like no other. For Edwards Island holds many secrets, it just depends whether you want to stick around long enough to learn the truth about them all.